NCAD Gallery presents ‘Of Shadow Of Ideas’, a solo exhibition of artist Aurélien Froment. The NCAD Gallery presents, 'Of Shadow Of Ideas', a solo exhibition of artist Aurélien Froment opening Thursday 3rd March 2016, 5.30pm. 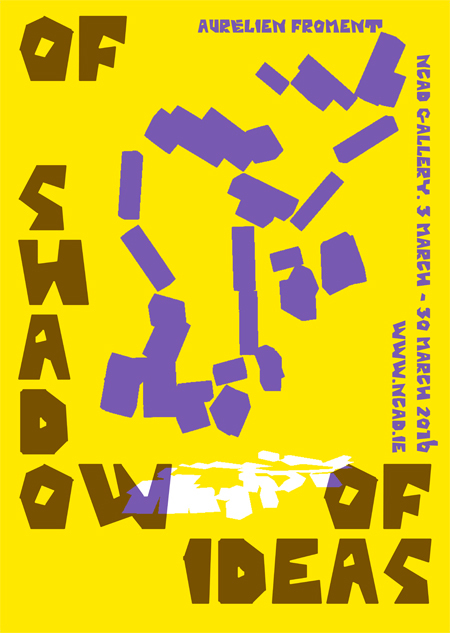 Of Shadow Of Ideas opening 5.30 - 8pm Thursday 3rd March 2016. Exhibition continues Friday 4th – Wednesday 30th March 2016. NCAD Gallery opening hours 1-5pm, Mon- Fri.
NCAD Gallery is closed on March 2016 dates: Thursday 17th, Friday 25th – Monday 28th reopening Tuesday 29th. ..its model is not a palace but a forest.. not as a depository of fixed appearances, not as the source of all taxonomy, but as an example of continuous metamorphosis. Froment’s installation of approximately ninety unmarked photographs represents three extensive research projects examining the life work of art and architecture autodidact Ferdinand Cheval, pedagogue and pioneering educationalist Frederick Fröbel and Italian architect Paolo Soleri. In his artworks, Aurélien Froment investigates subjectivity, montage and the experience of images and the spaces in which they exist. For Of Shadow Of Ideas he experimented with education curatorial methodologies. Froment enacted a seminar series over a six week period prior to the exhibition in association with the MA Art in Contemporary World (ACW). Through engaging the National College of Art and Design master’s degree students, Froment considers his presentation of material, in part, contingent on the relationships forged on a weekly basis in a dialogic setting. Central to the work is the interplay and reconfiguration of artist, institution and viewer relations. In retrospect, three life’s work share points of confluence in the becoming of an institution of a work, Cheval crafts a tomb museum in Palais Idéal, Fröbel in creating the first Kindergarten, Soleri in visioning Arcosanti. At the NCAD Gallery, a dynamic open viewing system confronts the viewer. Installed are nine dual aspect glass cases hanging freely from the gallery ceiling in an arrangement navigable from multiple standpoints; the encased photographs, mounted back to back allowing for a combination of viewing patterns to emerge. Upon arrival at the Gallery, an open-ended proposition is found. For the visitor there is no linear sequence to follow or reference list to consult. Stripped of context and narrative supposition, the artist bids viewers to position themselves in deciding their own vantage point to explore the cosmological configuration of photographs. Leaving no real interpretive security in which to take refuge, visitors are challenged to draw on their measured reasoning, imagination and worldview in attributing meaning. Subsequently, emergent interconnectedness between imagery is stimulated. Formulated through processes of mental play and mediation, viewers negotiate pathways through the exhibition activating the space; participants in a continuous state of process, encased by the glass-fronted architecture of the NCAD Gallery. Aurélien Froment was born in Angers, France in 1976, and has been living in Dublin, Ireland since 2008. His works comprise photographic series, films and installations. Many institutions have organised solo presentations of his work, including: Wattis (San Francisco), Le Crédac (Ivry-sur-Seine, France), Musée de Rochechouart (France), Gasworks (London), Montehermoso (Vitoria, Spanish Basque country), Bonniers Konsthalle (Stockholm), Palais de Tokyo (Paris), FRAC Champagne-Ardenne (Reims, France). He participated in the Sydney Biennial (2014), the Venice Biennial (2013), the Lyon Biennial, the Yokohama Triennale (2011) and the Gwangju Biennial (2010). In 2014, his exhibition Fröbel Fröbeled, which was first presented at the Contemporary Art Gallery in Vancouver, toured to Villa Arson (Nice, France), Spike Island (Bristol, UK), and Le Plateau/FRAC Ile-de-France in Paris, followed in 2015 at the Heidelberger Kunstverein (Heidelberg, Germany). In 2016, his work will be presented at Bunkier Sztuki (Krakow, Poland) and at FRAC Midi-Pyrénées / Les Abattoirs (Toulouse, France). Aurélien Froment's exhibition is commissioned by the NCAD Gallery. Of Shadow Of Ideas is kindly supported by FRAC Midi-Pyrénées / Les Abattoirs, Toulouse, France. Aurélien Froment is represented by Galerie Marcelle Alix. Exhibition production: Printing by Dominic Turner, Exhibit A, Dublin. Frames by Frank Prendergast. Poster designed by Åbäke, printed at NCAD by Jordan McQuaid with thanks to the Black Church Print Studio, Dublin. Seminar Participants: June Butler, Michelle Darmody, Dorje De Burgh, Karl Burke, Peter Dannenbaum, Hannah Fitz, Saidhbhín Gibson, Ramon Kassam, Anne Kelly, Sophie Loughran, Loretta Moore, Elisa Nocente. Thank you to Dr. Declan Long and Dr. Francis Halsall of ACW at NCAD, Temple Bar Gallery + Studios. Curator Anne Kelly NCAD Gallery 100 Thomas Street, Dublin, D08 K521, Ireland. Of Shadows Of Ideas is kindly supported by FRAC Midi-Pyrénées / Les Abattoirs, Toulouse, France.